Our eldest son, is starting to enjoy spicy food. He now demolishes platefuls of tandoori chicken wings, the spicy kind from the Asian supermarket, and has developed a remarkable tolerance for extra-hot peri-peri sauce. This is all good, and to be expected from a young Bradfordian. We know a thing or two about spicy food, you see. The other one, the little one, is showing no such enthusiasm. Yesterday, she decided that she could no longer tolerate ham. On pushing, she did concede to liking ham when it was hot, but not cold. I mean, seriously, what on earth? This curry was an attempt to cover all bases. It tastes Indian, it looks Indian, but its spicing comes from places other than the chilli plant. What we’ve got here is a fragrant lamb and tomato stew, with distinctly Asian overtones, something that’s mild, accommodating, but still packed with flavour and body. I love my chilli, but I also enjoyed this. by Christine Manfield was to use mutton shoulder, on the bone. Those bones make a hell of a difference, boosting the flavour and giving the dish real soul. Mutton shoulder is a good, economical cut, too, and Asian food like this is very suited to it…long, slow braising help the tough meat to soften into tenderness and give the subtle spices time to work their way into the meat. The tomato part of the dish is nothing more than 500g of ripe tomatoes, quartered and left to simmer gently for half an hour. To give this its twist, throw four cloves and a green cardamom pod into some hot oil, heated through in a large pan – the spices need to sizzle and spit – before adding the tomatoes. When the tomatoes have cooked to a soft pulp, push them through a sieve to remove the seeds and the skin, leaving a smooth sauce behind. For the base of the curry, heat a couple of tablespoons of vegetable oil in a large pan, and add two bay leaves, four cloves and four green cardamom pods, followed closely behind by 500g of thinly sliced red onions. Stir for a minute, then add eight cloves of minced garlic and two teaspoons of minced ginger. Lower the heat, cover the pan and cook for ten minutes until the onions start to turn pink and translucent. Add 500g of diced mutton, stir and cover. Cook for another ten minutes then add the tomato gravy and two teaspoons of salt. Cover the pan yet again and bubble away on a low heat for at least an hour, maybe longer, until the mutton is soft. 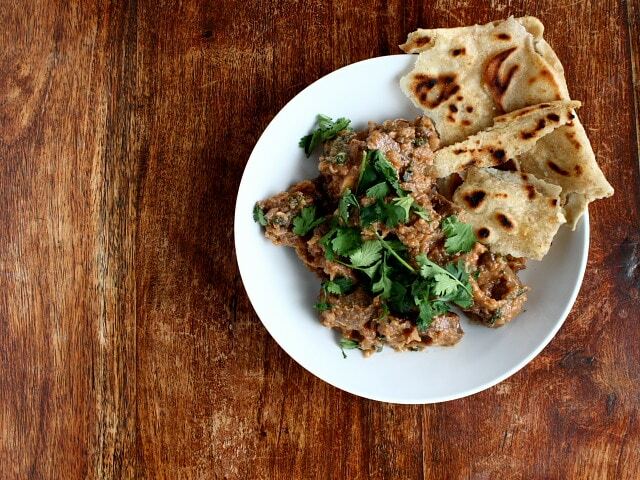 To finish, stir through a handful of chopped fresh coriander and serve with parathas or chapatis. 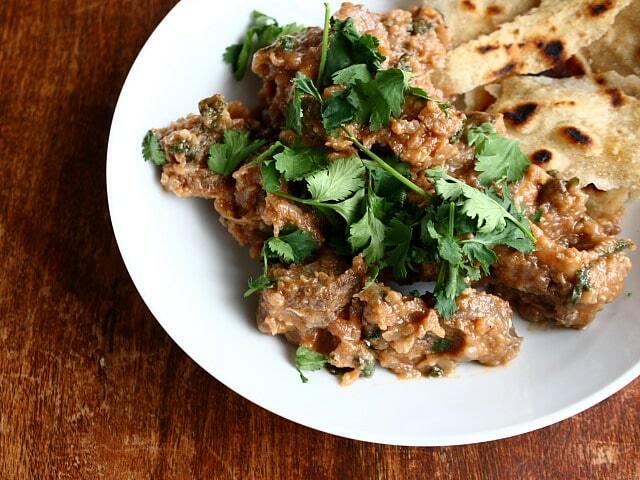 Looks really good and simple to make, love mutton as well one of my favourite meats much more flavour than lamb. I had to laugh at your description of your youngest being so fickle over ham. When my sister was little she would insist that every item of food was on a separate plate. She also told us she didn’t like chips because “chips taste like they smell and they smell horrible which is sad because they taste so good”…what? She still insists on having every item of food on a different plate though. Even though she’s in her 20s and works for Deloittes and has to partake in many, many business lunches. Oh dear. Major congrats on your FoodBuzz Top 9, today! Looks absolutely delicious! Superb click! lovely post, lovely looking recipe. I make kid friendly curries often, although my daughter is always yelling “GINGER!! !” and making a neat little pile of tiny ginger matchsticks on the side of her plate, I can’t bare to leave it out. Poor thing. Still, living in Bradford with in a curry loving family she just has to get used to it. Fed the baby quite a spiced lentil dahl yesterday. Did you make the chapatis too? Indian flatbreads so easy in principle, so hard to perfect! especially after eating the roti at Prashad – so thin you can see through them. Thanks for your lovely blog and beautiful photography – Inspiring.